The Brondell CleanSpa Hand Held bidet attachment is a simple sprayer, also known as a shattaf, that offers a cleansing water wash for a healthier way to clean after using the bathroom. It is a cold water sprayer that connects to your toilet's existing cold water supply. The CleanSpa Hand Held requires no batteries or electrical outlet. It can be mounted directly to the toilet tank or to the wall using the sprayer holster. The metal T-connection that connects to the water supply has a shut off valve for safety and to prevent water leakage. The sprayer can be adjusted for a single stream wash or a gentler widespray. 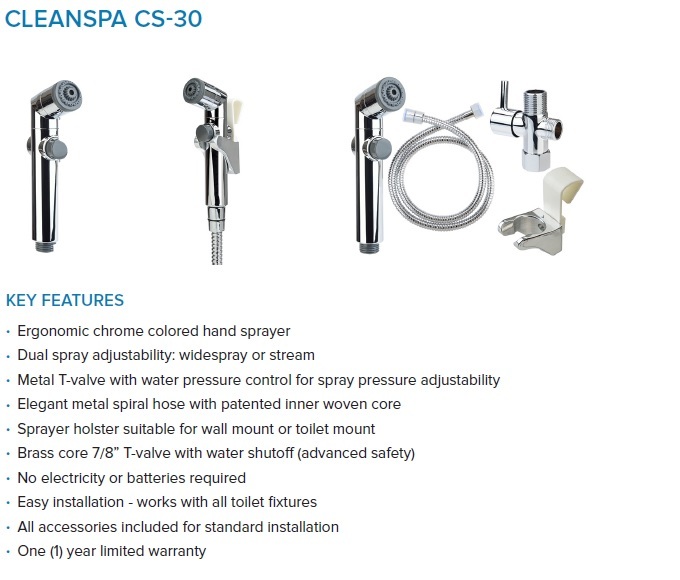 The CleanSpa Hand Held installs easily and comes with a one year 100% manufacturer's warranty. After living in the Middle East for years, I am back in the US and this device is what I missed in our bathroom!! I love this! I'd love it more if the spray had a temperature control AND a pressure control. It's a must have! This item is perfect for an alternative to high-tech bidets. Simple and effective. Most parts are metal which is a plus, and the attachment to the toilet tank does not require any modifications nor does it impact the aesthetic of the toilet. Love it!